The popularity of the oval form at court is well established. A significant proportion of plain jade bottles still in the Imperial collection are of this form, and similar miniature bottles also seem to have been made at court. It is difficult, however, to be certain of the provenance of plain bottles, but in this case we venture a palace workshops source and an eighteenth-century date. 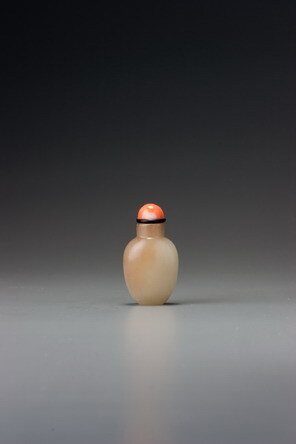 Apart from the form, the bottle has the characteristically heavy foot attributable to the palace workshops, the depth of which is 0.3 cm, or roughly a tenth of the overall height. The dating is based in part upon this feature, which appears to have been typical of the late eighteenth century, and upon the perfect formal integrity of the bottle, the detailing of the concave lip, and the excellent hollowing and finish. It is also based upon the choice of an otherwise rather dull material from which to make so fine a bottle. The use of intrinsically unimpressive nephrite was typical of the Qianlong palace workshops. To have produced such a well-made bottle in a comparatively dull material would have been rather unlikely at any other time, and with a bottle of this size the material could only have been a matter of deliberate choice. 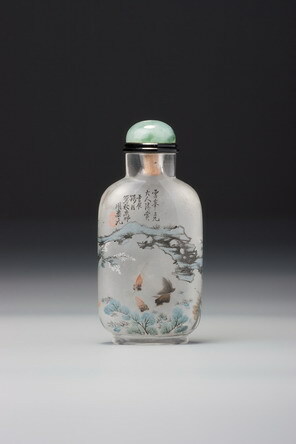 So little material is required that a private workshop might have been expected to use a more inherently precious jade in producing so perfectly executed a bottle.